One of the earliest civilizations to the world is the Egyptian civilization. In fact, till today great scientist still, stand in awe of some of the technology products of ancient Egypt. Sitting at the peak of this civilization is the Pharaoh, king of Egypt. It is only very ideal that whenever the Egyptian based slot games are the subject, the Pharaoh theme slots games should be the center of it. This remains true that the Pyramids of Egypt is a symbol known over several generations as where great heads of unforgettable kings laid. 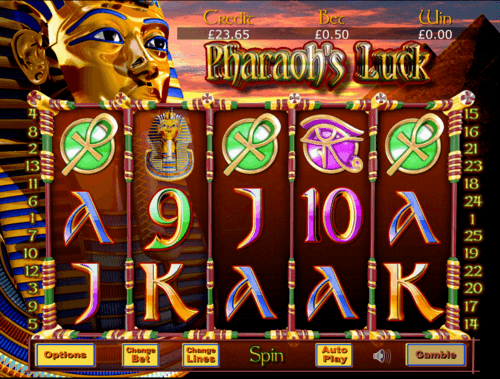 The Pharaoh themed slot games, therefore, promise an inexhaustible wealth of Egypt in a blended old and new fashion. Since the existence of the ancient Egyptian empire, the Legend of the Pharaohs slot game ushers you into the travel to the valley. The Pharaohs have been infamous with a different wealth of leadership, and technical skills. More so, in the ability of the culture to accommodate many other civilizations and build something with it. The online slot game has five reels and three rows, based on a 20 payline winning ways. Barcrest crafted the game not only to attract but suit the target of players. Money-making symbols include the king, the lady, valet, and the other symbols. The number of pyramids you can get in a row gets you free spins and three bonus extras. 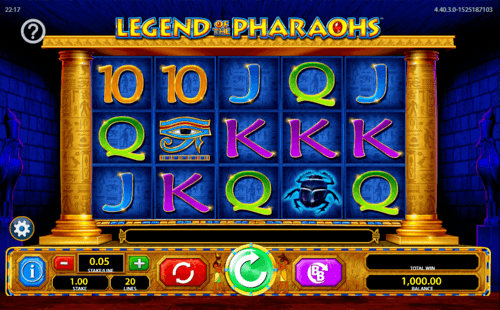 Pharaoh’s Luck slot depicts the god-like king of the Egypt of ancient times and how his decrees are entirely unchangeable. Eyecon designed this game to represent the total power that resides in the Egyptian Pharaoh. Two characteristic features on the background are the golden statue of the Pharaoh himself and at the other end is the infamous pyramid. The borders of the frame represent the ancient Egyptian art and that which shows royalty at the same time. The online slot game as available on Money Reels has an impressive Return to Player (RTP) rating of 97.52%. The game has five reels, three rows, and 25 payline winning combinations. Your bet multiple can also rank up to 50x of a total bet while a bonus multiplier can give you up to 200x. Core gaming decides to go to the other side of things to create their concept of what the Pharaoh’s tombs are. 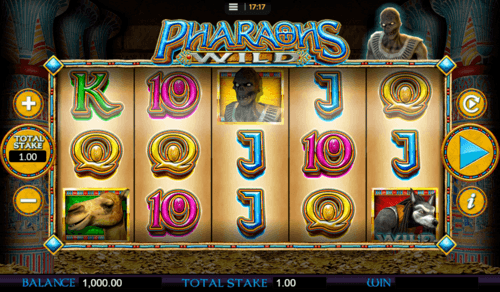 Pharaoh’s Wild uk slot sources from Egyptian mythology that consists of mummies, monsters in crypts and Anubis, the Egyptian god of the underworld. The created concept expects the player to find the treasures from the presence of these threats, bent on keeping him in the tomb. Any player that sees the treasure survives the attacks, and comes out of grave alive wins the game. The game consists of 3 rows, five reels and 20 paylines of impressive ways to win. The RTP stands at 94%. The winning symbols include the undead mummy, a camel, a pharaoh’s mask, a golden lamb, Anubis, and a Moon symbol. 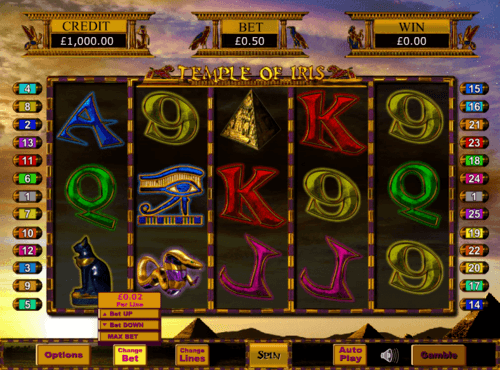 Temple of the Iris Jackpot slot comes with 25 different payline winning combinations and five reels. It also offers 240 free spins with three times multiplier and a maximum multiple of 1350 times their stake at every spin. The significant winning symbols include the ankh cross, the basket, the cat dog, apep, the snake, the priestess, the scatter symbol. All of these symbols are in addition to the J, A, K, and Q combination alphabets. If players find the scarab beetle or the horus too, it can earn them up to 38 times of their bet. However, the most valuable treasure is the princess, which can give about 380 times his initial placed bet. It is now well-pronounced that the Egyptian mythology is going nowhere, as far as relevance and value are concerned. Neither are their associated counterparts like the Cleopatra and the Egyptian gods. Playson, with this in mind, also decides to engrave their name in the sand of time by developing a Pharaoh themed slot game known as the Kingdom of the Sun: Golden Age online slot. 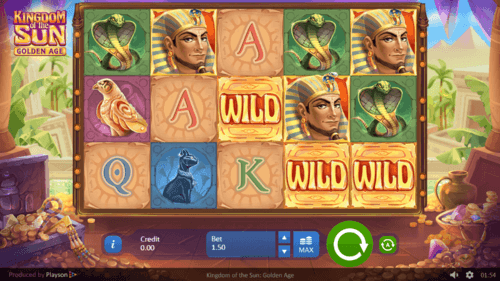 The game has six reels, three rows, and 15 paylines to portray great Egyptian treasure and prizes for players to win. In addition to our playing cards alphabet symbols, the other winning symbols include the different Pharaohs and the irresistible Cleopatra.